What on Earth was Con 80? - I hear you ask. Con 80: The Ultimate 1980s Sci-Fi Experience was an independently run, one-of-a-kind, non-profit science fiction convention that was held on March 11-13 (Labour Day long weekend) in Melbourne, Australia. 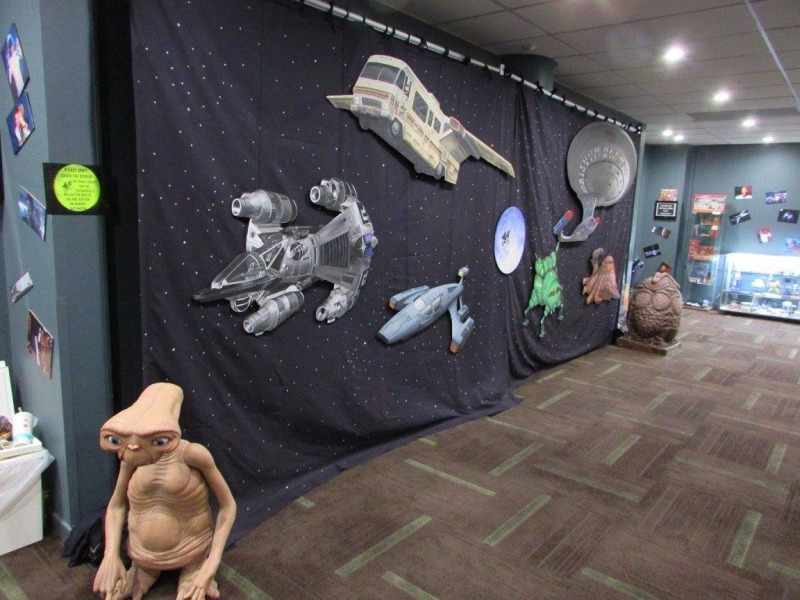 The aim of the convention was to provide an opportunity for fans to come together and relive the joys of 1980s science fiction movies and TV shows for three wonderful days ... and they did. Here's our Con 80 Opening Ceremony video. Our conventions became renown for having great displays created by The Vile and Con 80 was no different as can be seen here. Oh and in case you're wondering, all these 'one off' paintings were auctioned off to eager customers. The 80s was the decade of merchandise as these displays proved. 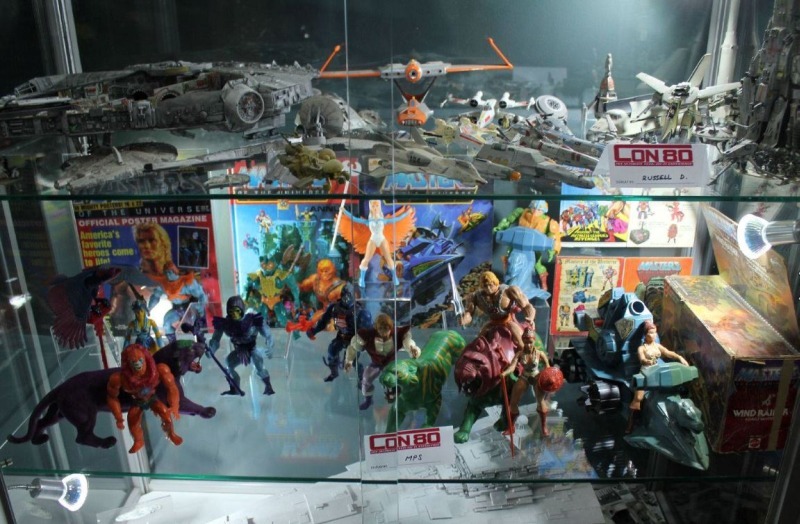 Featured items included Superman II, The Empire Strikes Back, V The Mini Series, Dune, The Thing, even the Ewok films! More of our excellent displays! 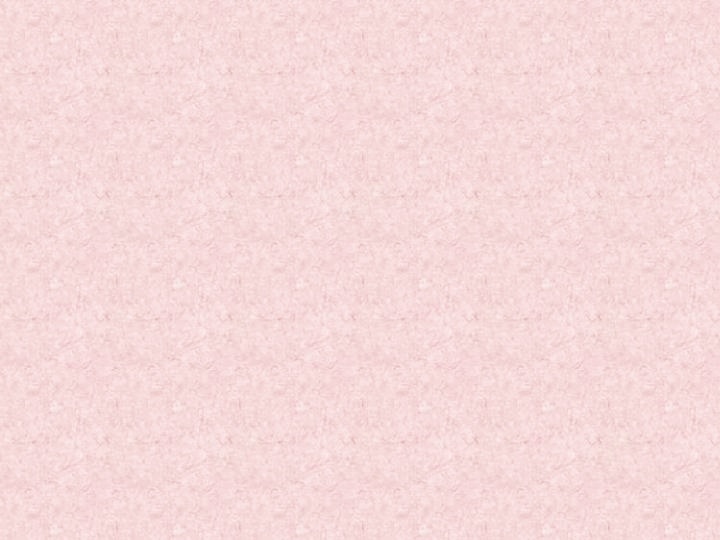 Like Con 9 and Con 70 before it, Con 80's focal point were its panels. These were designed to not only educate and entertain attendees, but to just relive our favourite 80s classics which many people have long since forgotten. When creating Con 80 even the smallest details were considered. 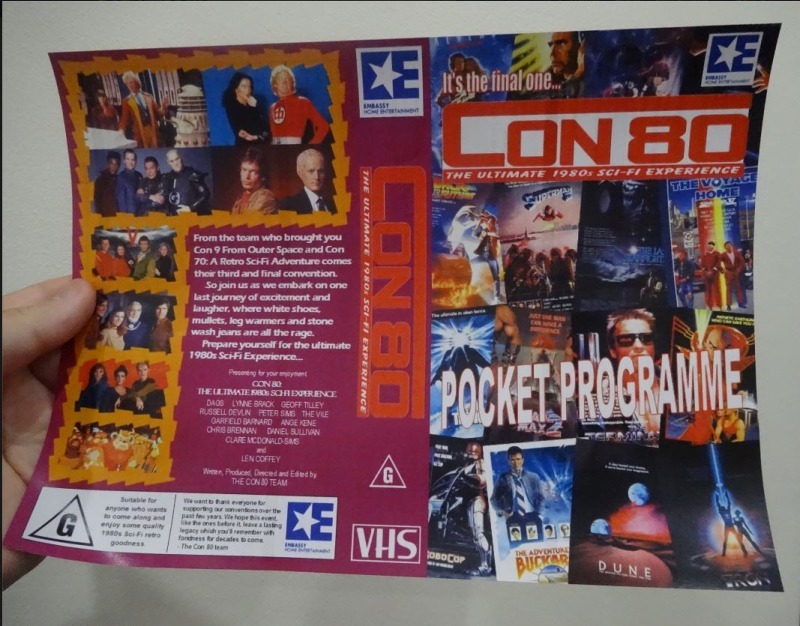 In this case the pocket programme was not only styled after an 80s VHS video sleeve, but it actually fit into a VHS case - which some members actually did to create the ultimate Con 80 memento! 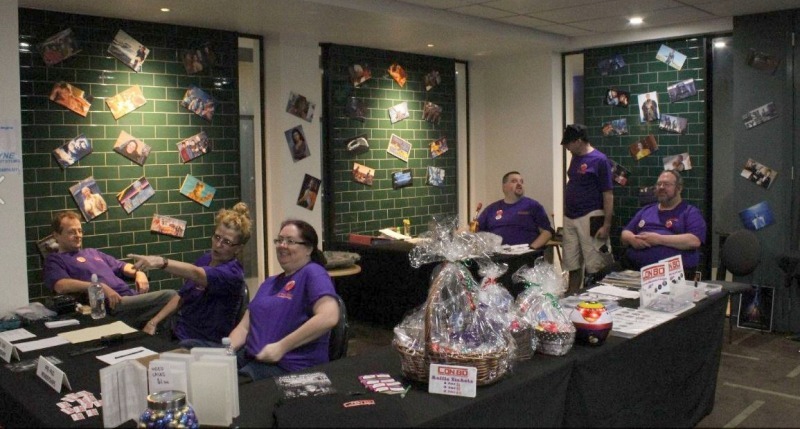 The heart of all conventions, the Registration area with our team hard at work! Our Saturday night movie screening was a great success and with it came our now famous popcorn and drink 'ConBos'. What made these items particular unique is that every every single water bottle label featured a different movie or TV show design which made them instantly collectable. No convention is complete without a trivia quiz. 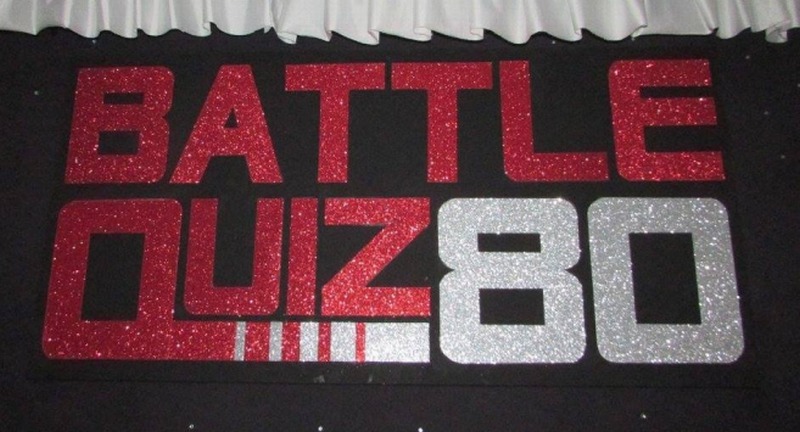 As a result Battle Quiz '80 saw numerous teams fight it out to see who really knew their 80's Sci-Fi! 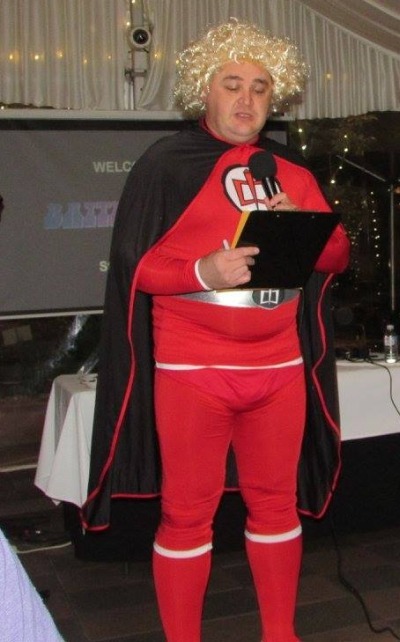 You can't have a trivia quiz without an appropriate host, and believe it or not ours featured a superhero ... if only he knew where the instruction book was! Tell me more, like where did Con 80 come from??? The history behind Con 80 is a somewhat interesting one. After the great joy which was Con 9 From Outer Space way back in 2012, our convention team opted to run Con 70: A Retro Sci-Fi Adventure in 2015 which was intended to be a lead up to Con 80 as part of our own special Sci-Fi convention trilogy. 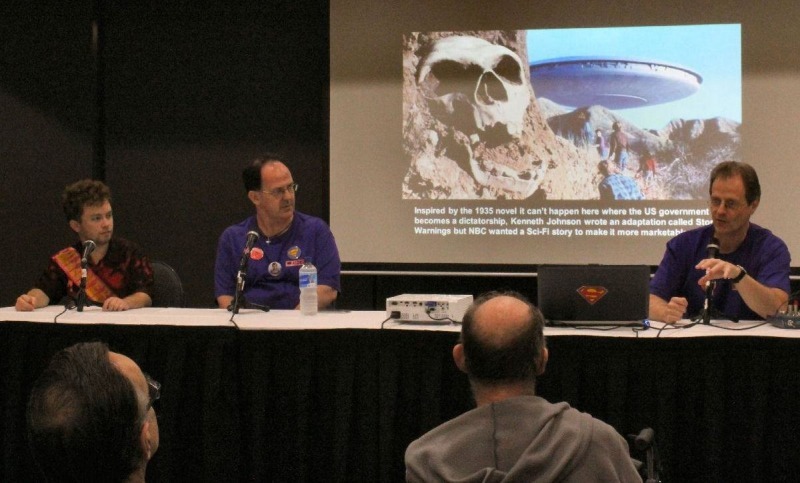 Amazingly, throughout the whole three days while Con 70 was being held, the talk of Con 80 was unrelenting with many people discussing the event as if it was already a forgone conclusion. However, it was only once we balanced the books for Con 70, which occurred the day after the convention finished, did Con 80 become an official reality - up until that point its future was 50/50. From a practical point of view, we realised during both Con 9 and Con 70 there was definitely a place in the fan community - albeit a small one - for a non-commercialised science fiction media convention which people were happy to attend, even if we didn't have any overseas actors signing autographs or taking photos. From a content perspective, the 80s were huge within science fiction circles. 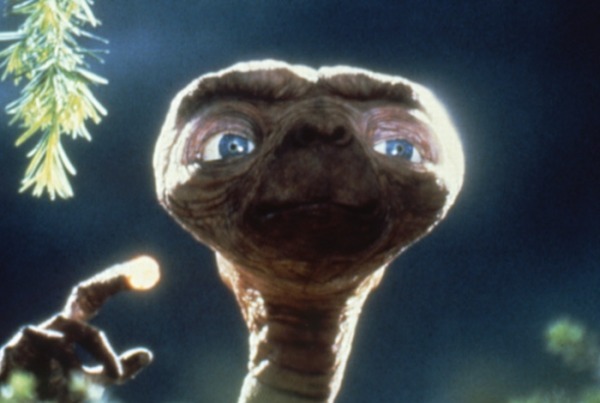 Not only was there a proliferous amount of great movie material being released - including a large number of sequels to films that originated in the 1970s - but many classic TV shows found their stride in the 80s too. Also within the fan community, a number of fan clubs and conventions were either created in this decade or they hit stride during this period, which is one area Con 80 will be covering in detail. Despite our tiny size, we've created a small, yet enthusiastic support base over the past two conventions who are very loyal to our events. So it's to these people - and the ones who will be joining us for the first time - that this convention, which will also be our final, is dedicated to. By the fans for the fans, one last time.